Look the picture above! See its beautiful carving of our professional craftsman. 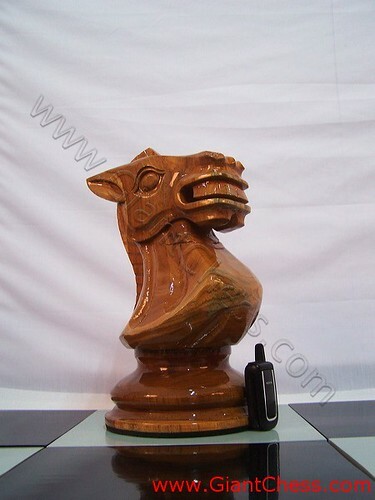 The Knight or horse chess piece has important role in chess game. The Knight can move from one corner to the other of any 2x3 rectangle of squares. The Knight is also the only piece that can jump over any other chess pieces. He stand besides bishop and rook and behind a pawn. Every players of chess game will get two knight, which stand left and right of the King. On the picture is one example of our knight chess pieces. It is brown color or natural wood color. It has made of Teak wood and carved by professional craftsman. This carved wooden knight chess piece is standart chess models. We have various models of chess pieces and you can contact us for the details. Very perfect for decorate your house or a gift for your children and friends. We also provide another chess pieces that has designed in different and has unique touch from our craftsman. Get it now! You can also order in some sizes. We provide standart size, big size and giant size.